Paul Savage, Head of Entertainment Sales & Marketing, and Danielle Madden, Marketing Assistant, were handed the award. The Bonus Arena in Hull has won a global marketing award – beating campaigns by Ed Sheeran and Amazon Prime in the process. The winners of TheTicketingBusiness Awards 2019 were announced on Tuesday during a private ceremony at Emirates Old Trafford, Manchester. The arena’s marketing team won the ‘Campaign of the Year’ award for their Open To All campaign. 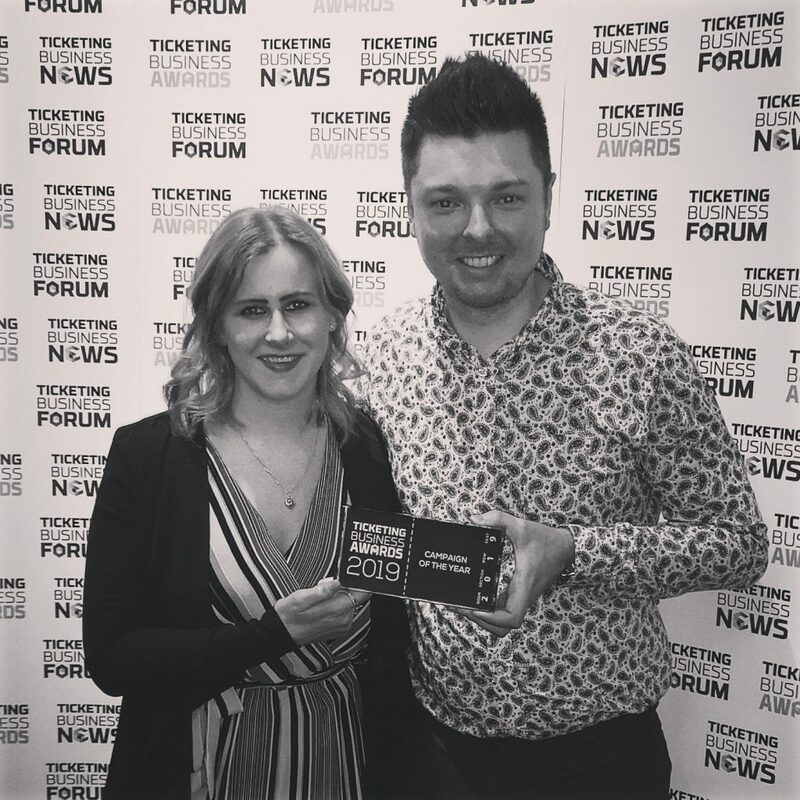 Paul Savage, Head of Entertainment Sales & Marketing, and Danielle Madden, Marketing Assistant, were handed the award beating campaigns by Amazon Prime Day, “Ed Sheeran ÷ Stadium Tour Fan Engagement” – Kilimanjaro Live/DHP/AEG/FanFairAlliance/ Victim of Viagogo, Major League Soccer side Atlanta United, Basketball Club Zalgiris Kaunas, Lithuania and “Beautiful, The Carol King Story” by Ticketek/Michael Cassel Group/Her Majesty’s Theatre, Australia. The Open To All campaign showcased the Bonus Arena’s opening, charting the moving in period and focused on interactive social content to show off the new facility. This included The Grand Flush, where staff invited local people to simultaneously flush the arena’s toilets as part of the testing process. Hundreds of residents turned up and were given the very first public tour of the building as a reward. Be the first to comment on "Bonus Arena wins international award for best marketing campaign"